Dr. Kazunori Kataoka is a Senior Vice-President and a Director General of Innovation Center of NanoMedicine (iCONM), Kawasaki Institute of Industry Promotion. He is also a Professor at Policy Alternatives Research Institute, The University of Tokyo. He received his B.Eng. (1974) in Organic Chemistry, M.Eng. (1976) and Ph.D. (1979) in Polymer Chemistry from The University of Tokyo. He started his academic career at Institute of Biomedical Engineering, Tokyo Women_Ñés Medical College as Assistant Professor (1979) and was promoted to Associate Professor in 1988. He moved to Department of Materials Engineering, Tokyo University of Science in 1989 as Associate Professor and was promoted to full Professor in 1994. He joined Department of Materials Engineering, The University of Tokyo in 1998 as full Professor. He was appointed joint-position of full Professor at Center for Disease Biology and Integrative Medicine, The University of Toyo Medical School in 2004. In 2016, he took mandatory retirement from Graduate School of Engineering/Graduate School of Medicine, The University of Tokyo, and moved to the current position. He has been appointed as Adjunct Professor at Eshelman School of Pharmacy, University of North Carolina Chapel Hill since 2015. He was a Visiting Professor at the University of Paris XIII, France (1992, 1996), Tohoku University, Sendai, Japan (2007), and Ludwig-Maximillians University, Munich, Germany (2008). He received a title of Honorary Professor from Sichuan University, Chengdu, China in 2012, and a title of Guest Professor from Zhejiang University, Hangzhou, China (2010) and Harbin Engineering University, Harbin, China (2016). He has been appointed as Adjunct Professor at Eshelman School of Pharmacy, University of North Carolina Chapel Hill since 2015. 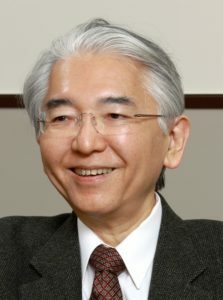 He has received several scientific awards, including the Society Award from the Japanese Society for Biomaterials (1993), the Outstanding Paper Award from the Controlled Release Society (1995), the Society Award from the Society of Polymer Science, Japan (2000), the Clemson Award in Basic Research from the Society for Biomaterials, USA (2005), the BarrÕ© Award from the University of Montreal (2006), the Founder_Ñés Award from the Controlled Release Society (2008), the National Institute of Materials Science Award, Japan (2009), the Prize for Science and Technology from the Ministry of Education, Culture, Sports, Science and Technology, Japan (2010), Humboldt Research Award from Alexander von Humboldt Foundation (2012), Leo Esaki Prize (2012), SPSJ Award for Outstanding Achievements in Polymer Science and Technology (2014), Lifetime Achievement Award, Journal of Drug Targeting (2014), and Gutenberg Research Award, Johannes Gutenberg University Mainz (2015) . He has been a member of the Science Council of Japan since 2006. Supramolecular biomaterials for nanobiotechnology, focusing on drug and gene delivery systems.